It's safe to say that mobile developers are excited about the prospects of Apple's ARKit, with demos popping up seemingly on the hour on YouTube, Twitter, etc. Now, developers are starting to preview actual products. One of them, Directive Games based in Shanghai, China, has come forward with a preview of an augmented reality game that will take advantage of ARKit's surface detection tracking. 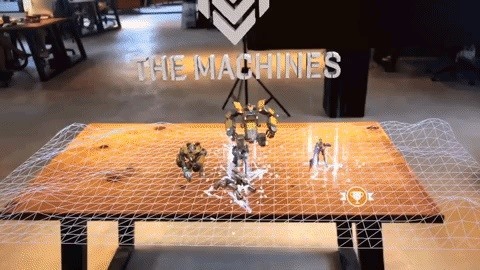 The Machines, described as a "moba-inspired AR PVP game," tasks players with building an army of mechanical soldiers and going to battle with each other. Players deploy up to four robots at a time onto an AR battlefield, projected onto a tabletop, and proceed to attack as programmed. A YouTube video demonstrates the action, and also shows indicators for in-game currency, presumably for upgrades (and assumingly available via in-game purchase). According to tweets from the developer, the game was designed using ARKit and Unreal Engine 4. A release date is not available, but we can assume that this will not arrive until iOS 11 and ARKit are publicly released this Fall. Those interested in updates can sign-up at the game's webpage.